Adults who grew up with and loved John Hughes’ films from the mid-1980s (SIXTEEN CANDLES; THE BREAKFAST CLUB; FERRIS BUELLER’S DAY OFF) and their teenage children will find a lot of similarity in Greg Berlanti’s new film, LOVE, SIMON. 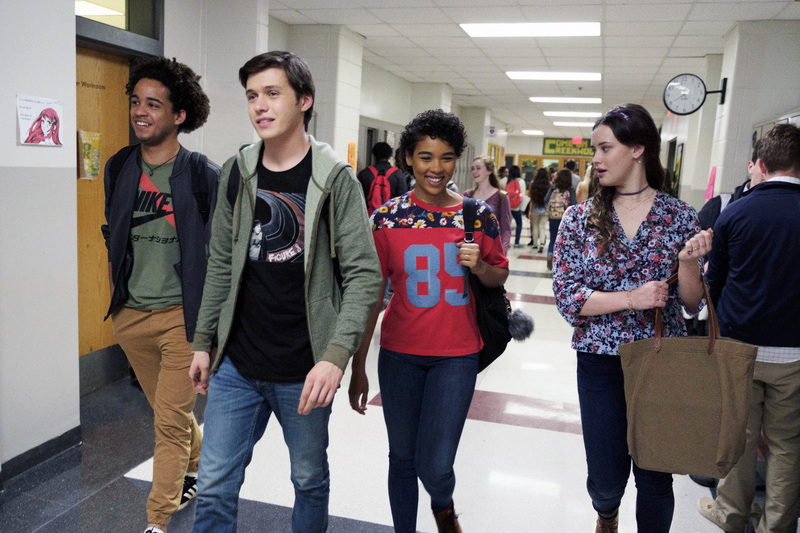 Based on the novel “Simon vs. the Homo Sapiens Agenda” by Becky Albertalli, LOVE, SIMON tells the story of Simon Spier (Nick Robinson, JURASSIC WORLD), a popular, high school senior who lives in a leafy Atlanta suburb along with his picture frame-model parents, Emily and Jack (played by Jennifer Garner and Josh Duhamel), and his aspiring chef younger sister, Nora. Everything in Simon’s life seems perfect though he’s keeping a huge secret inside him: he’s gay. One day, after a fellow student in his perfectly diverse school (except for being LGBTIQ, apparently) posts on the school’s e-bulletin board that he’s struggling with a similar secret, Simon begins an anonymous correspondence with the stranger, sharing his true feelings for the first time in his life while at the same time trying to figure out who this mystery person is. Simon’s carefully managed world starts to unravel though, when his arch-nemesis, Martin (Logan Miller, BEFORE I FALL), stumbles upon the emails and threatens to out Simon to the school unless Simon fixes him up on a date with his friend, Abby (Alexandra Shipp, X-MEN: APOCALYPSE). It’s been a while since I was in high school so it’s quite possible that I don’t remember what it was like. I’m pretty sure, though, it was nothing like Simon’s experience. As Simon says in a voiceover at the outset of the film, he’s just like us, except that I don’t recall hopping into the SUV that my parents bought me for my birthday, picking up my three besties and swinging over to the neighbour drive-thru for a round of iced coffees before heading off to school. At the risk of sounding like my father, I walked to school… through snow… every day… and just barely made it to Home Room on time. And, although we surely had gay classmates, they were all very much in the closet back then. I remember when the first of my contemporaries (he went to a different school but we knew each other) came out. It was huge news in the community. In recent years, a few of my friends’ kids have come out and, guess what, it’s no big deal. So what’s all the fuss with LOVE, SIMON? Yes, it’s the first time a major studio (Fox) has made a romcom centering on a gay character that is pitched squarely at the teen demographic but this film is about 15 years too late. A number of TV shows have dealt with gay romance and inclusion for years. Better late than never? Perhaps. Supporters of this film will say that it will hopefully spur on more films about gay inclusion to be made. They may be right and, if so, that’s a good thing but in its attempt to be accessible to everyone, the screenwriters make Simon and his world highly polished to a fault. Maybe complicated, gay characters only belong in arthouse films like MOONLIGHT and CALL ME BY YOUR NAME. I get why so many people are in love with this movie but, unfortunately, I’m not one of them. I liked the performances – Tony Hale (TV’s ARRESTED DEVELOPMENT), who plays the school’s tragically unhip vice principal, and former SNL writer Natasha Rothwell, who plays the school’s no-nonsense drama teacher, are the film’s bright spots – but not the story. It’s too safe. The final scene on the ferris wheel is unearned (though I understand that the book deals with this scene better than the film does) and Simon’s relationship with his BFF, Leah (Katherine Langford, TV’s 13 REASONS WHY), is unrealistic. Either she’s completely dense for not knowing that Simon is gay without him telling her so or they’re not as close as they think they are. As one of my friends said as we were leaving the cinema, “Now gay people have their own John Hughes film.” Fair enough. I just hope that future films in this genre will be more challenging than this one is.